When physicists refer to "critical mass" (the transformative moment when "the smallest amount of fissile material needed for a nuclear chain reaction" occurs), it is a potentially violent and nearly invariably ugly moment. But when the people's movement reaches this level of activity it is beautiful! It can be truly glorious, like when Christian Egyptians formed a protective line of defense so their Muslim brothers and sisters could observe Azzan (the call to prayer) during the Arab Spring uprising at Tahrir Square. 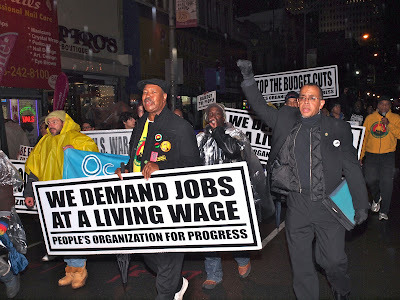 It can be awe-inspiring, like when the NYC municipal unions joined Occupy Wall Street and that youth-led movement became truly mass in scope, or when folks replicated OWS in city-after-city (and small towns as well) across the US! 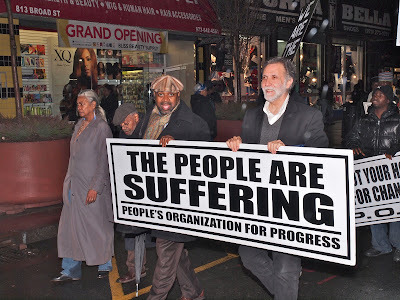 It is fantastic, like the day People's Organization for Progress chair Larry Hamm recalls from the divestiture movement at Princeton when the daily demonstration against apartheid South Africa grew from tens of participants to hundreds! Young Occupy Newark activists marched from their Military Park occupation site to rally with the People's Daily Campaign at the Essex County Courthouse. 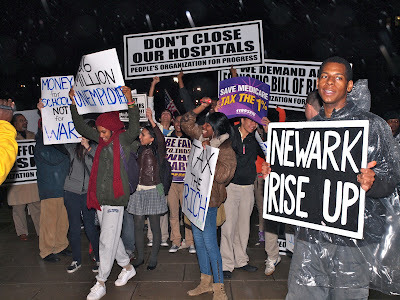 And Newark's People's Daily Campaign may have hit this "transformative moment" on Tuesday, December 6 (a day so rainy that many activists feared the planned demonstration might flop) when more than 200 marchers, representing approximately 130 churches, labor union locals, students from Essex County Community College, school kids from Science High, activists from the recently begun Occupy Newark encampment, and many, many more joined the regular daily picket line near the Essex County Courthouse (see the Star Ledger article, here). Youth participation is key to the future of popular movements. 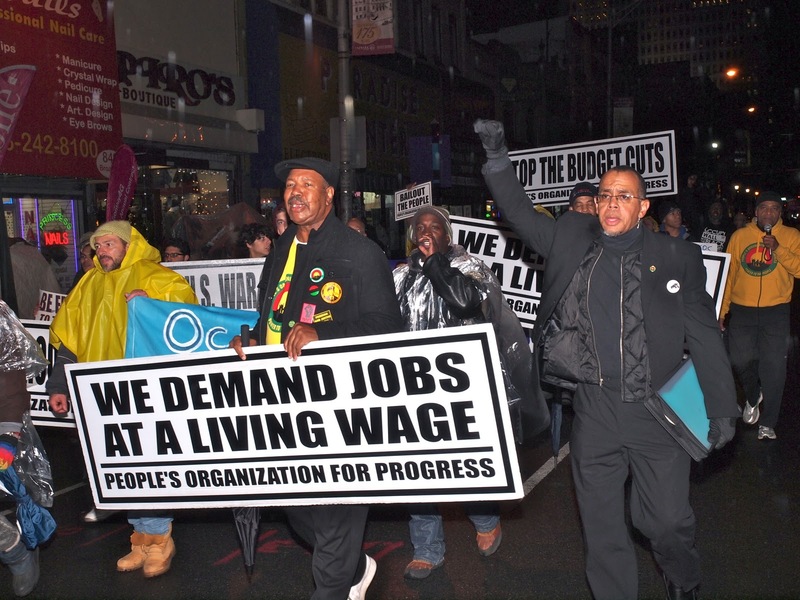 The People's Daily Campaign for Jobs, Peace, Equality & Justice chose December 6 for this march and rally to honor Mrs. Rosa Parks who was arrested on December 1, 1955 when she refused to vacate her seat on a public bus for a white passenger and sparked the Montgomery Bus Boycott of 1955-1956. The People's Organization for Progress and the Daily Demonstration Coalition took our inspiration from that boycott which began on December 5th when the Women's Political Council of Montgomery and labor activist E.D. Nixon (a Pullman Porter who worked with A. Philip Randolph) began the Montgomery Bus Boycott. That boycott continued for more than 380 days, and it is POP's intent to continue the daily pickets for at least the identical length of time. Unionized hospital workers represented by 1199SEIU join the People's Daily Campaign. The role of both movement elders and young activists was critical to the success of this transformative rally and demonstration. 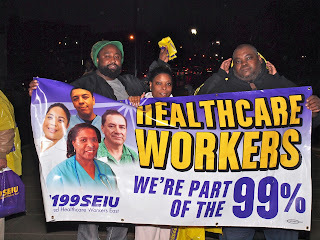 Stalwarts of local community and national activism Amiri and Amina Baraka joined us on this difficult rain-drenched evening as they marched along-side their son Ras Baraka (South Ward Councilman and principal of Newark's Central High School). 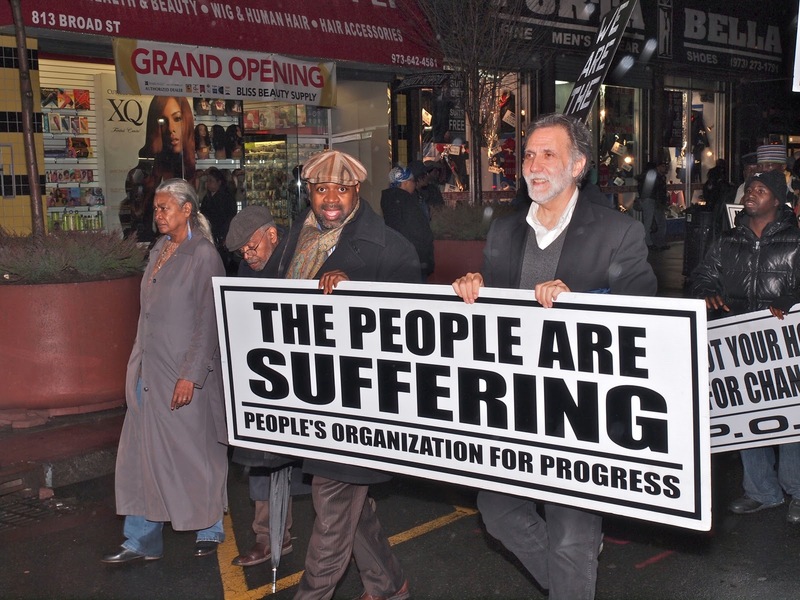 Poets and activists Amina and Amiri Baraka march with their son, City Councilman Ras Baraka, as well as Newark Public School Advisory Board member Richard Cammerieri. 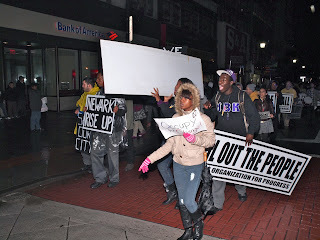 The importance of new and younger organizers was highlighted by the presence of Occupy Newark, high school students from Science High, young teachers from Teachers as Leaders in Newark, and an impressive number of other young people. For additional photos from this important demonstration see pictures by my friend Jon Levine here.